Welcome to La Lotería — a new take on authentic Mexican cuisine from Executive Chef/Owner Julieta Ballesteros (Crema, Los Feliz) and Managing Partner/Owner Jaime Herrera. The game La Lotería has been played throughout Mexico since Colonial times. Similar in concept to American Bingo, it is played using 54 widely varied characters and symbols of Mexican culture (like the skull, the moon, the mermaid & the rooster), and it inspires our ambiance, drinks, and menu. Not unlike the game, Mexican cuisine is unique, varied and steeped in tradition. With the cultural touchstone of La Lotería at its core, the restaurant will introduce to New York’s sophisticated palate an exciting and surprising mix of Mexican recipes, ranging from the deliciously elemental “street” taco, to the scallops with Mexican black truffle. Come experience the spirit of La Lotería. Our specialty drinks and inspired cuisine await you in our inviting, newly designed West Village space. We're at 29 7th Ave. South (Between Bedford & Morton) in the West Village. 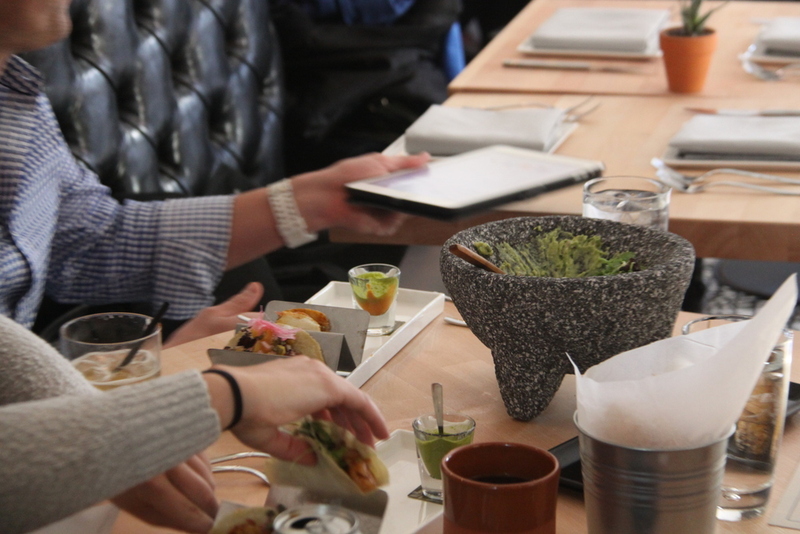 Experience the best Mexican food NYC has to offer! Let our experienced bartenders whip up a fantastic margarita for you! Julieta is a native of Monterrey, Mexico where she worked in the Executive Dining Room at Alfa Corporativo. Julieta embarked on her culinary adventure in 1996 and she graduated from The French Culinary Institute in 1998. She kicked off her career as executive chef of New York’s famed Mexicana Mama in the West Village. Julieta’s training at the French Culinary Institute and her roots as a young and versatile Mexican woman, combine to form her elegant yet hearty cuisine. She has been a guest consulting chef on Gordon Ramsey’s “Kitchen Nightmares” and has appeared on “Martha Stewart Living Radio”. Julieta has also been featured in “New York Cooks: 100 Best Recipes from the City’s Best Chefs” by Barbara Winkler and Joann Krellenstein. She has also participated in Iron Chef America and in Beat Bobby Flay both from the Food Network. Julieta is an extremely talented chef whose cuisine is described as modern Mexican with a dynamic French presentation. Julieta opened her very own restaurant in 2006 called “Crema Restaurante” in Chelsea NY, she is also the Executive Chef at Los Feliz in the East Village and now opens her newest restaurant La Lotería in the West Village. Jaime is also a native of Monterrey, Mexico and he brings experience in business as well as the culinary aspects of the restaurant. Jaime has a bachelor’s degree in business administration, a culinary arts diploma from the French Culinary Institute and a restaurant management diploma also from the FCI. He has worked in kitchens both in Mexico and New York, where he has worked under the acclaimed Mexican chef Julieta Ballesteros in her Chelsea based Crema Restaurante. Jaime now joins forces with Julieta in launching their new restaurant La Lotería in the West Village.